many crystal shows strange properties due to special combination of their inter molecular structure. A piezo electric material is such a material in which a potential difference appears when it's physical shape is deformed by external mechanical force. this potential appears due to displacement of charges in the atomic structure of the crystal. the effect is a reversible process,. that means if we apply potential difference in the side of the crystal, the shape of the crystal will be deformed. 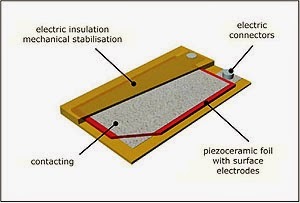 the elements exhibiting piezoelectric effect are called electro-resistive elements. there is mainly two types of piezoelectric crystal. another type is synthetic like lithium sulphate, ethylene diamine tartrate etc. mechanical deformation can be made in various way like thickness expansion, transverse expansion, thicknesses shear etc. mechanical deformation produces charges and this charge appears in form of voltage across two terminals. the polarity of the voltage is very direction sensible, if a tensile force produces a voltage of one polarity and compressing force causes the opposite. there are various type of application of piezo mainly in electronics! 2. it is used as pressure sensor, a electrical signal is produced due to deformation, and it is analysed by a analyser circuit to know the pressure applied. 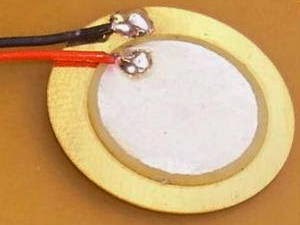 4.one interesting application of piezo is producing electricity, suppose think one such crystal is placed inside your shoes,then for each and every step it will be deformed and the produced charge is harvested in a li-ion battery inside, this charge can be used to recharge your cellular phone. scientists are planning to place thousands of piezos under footpaths. that can be effective alternative in producing energy from human. Why transformer rating in KVA or VA?